This document is an update to the specifications contained in the Affected Documents table. This document is a compilation of device and documentation sighting, specification clarifications, and changes. It is intended for hardware system manufacturers and software developers of applications, operating systems, or tools. Information types defined in Nomenclature are consolidated into the ...specification update and are no longer published in other documents. This document may also contain information that was not previously published. Information types defined in Nomenclature are consolidated into the specification update and are no longer published in other documents. 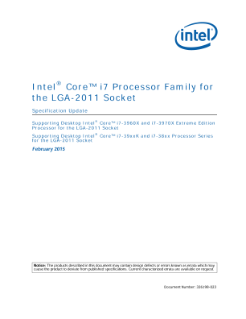 Read the full Intel® Core™ i7 Processor Family for the LGA-2011 Socket Specification Update.